Ongoing attempts to expand Islamic law in Malaysia have changed its political landscape, and may be the most important factor in maintaining the Najib Razak administration's grip on power. Analysts say a 2014 joint committee to explore the implementation of "hudud" - the Islamic criminal code with punishments that included death by stoning and amputation - formed with the opposition Parti Islam SeMalaysia (PAS) was a masterstroke by the embattled Prime Minister in his quest for another term despite growing disenchantment with his governing Barisan Nasional (BN) coalition. The current tussle is over legal changes to allow Malaysia's Syariah Courts to impose jail terms up to 30 years, fines as much as RM100,000 (S$31,750) and as many as 100 lashes for various crimes - dramatically more than three years, RM5,000 and six lashes at present, but technically not hudud. However, it has been enough to cause bitter divisions in the opposition. "He (PM Najib) didn't need to do much," sociopolitical analyst Eddin Khoo told The Straits Times. "He's just poked and the opposition has imploded." BN lost the popular vote in 2013 for the first time in its six decades in power but still formed a government having skewed electoral maps which ensured that it still controlled 60 per cent of Parliament. Since then, allegations of graft and economic headwinds have combined to sink Datuk Seri Najib's approval ratings to record lows. But the multiracial BN is now expected to win a general election due by August 2018 almost by default, as the push for wider Islamic law has caused a growing schism in the disparate opposition. While PAS has clawed back the Malay support it ceded in 2013, the loss of non-Malay backing and potential multi-cornered fights in its traditional strongholds would also hand the advantage to Umno. A stronger Umno keeps the BN in power. The push has also helped Mr Najib as many Malay-Muslim voters support closer political ties between PAS and Umno, BN's lead party. PAS has now split with its former opposition colleagues, leaving the parties in the newly-formed Pakatan Harapan (PH) struggling to appease their core non-Muslim support while trying to fend off accusations of being anti-Islam. That has resulted in the leaders of the opposition pact repeatedly contradicting each other. 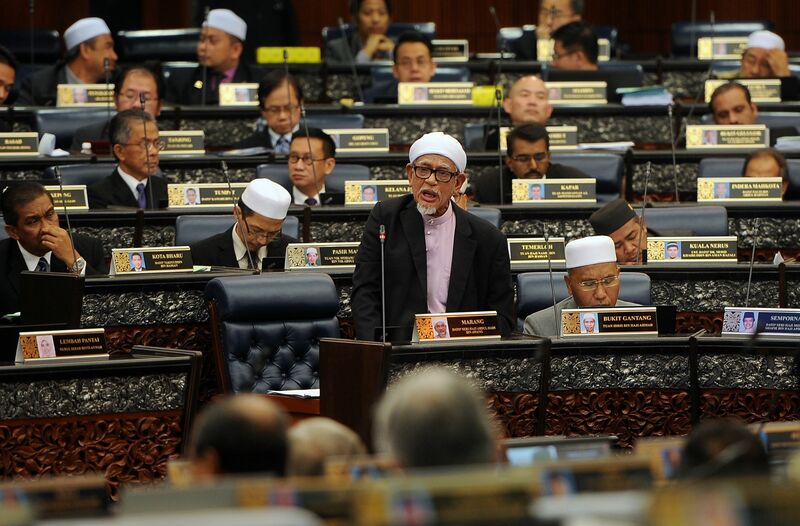 PAS president Abdul Hadi Awang was allowed to table amendments to the Syariah Courts (Criminal Jurisdiction) Act in Parliament for the third time in a year on April 6, before the Speaker abruptly ended proceedings without allowing dissenting debate or a vote. This came after pushback from the non-Muslim BN partners of Umno. "BN components can tell their constituents they triumphed," said S. Rajaratnam School of International Studies' senior fellow Oh Ei Sun, adding that both Umno and PAS can talk up their Islamic credentials to the Malay-Muslim voters who are growing more conservative. The largest opposition outfit in Parliament, the Democratic Action Party, is totally opposed to the amendments, but the man it backs as the next prime minister is Parti Keadilan Rakyat's jailed leader Anwar Ibrahim. In a statement on April 8, Anwar said that "the strengthening of the Syariah Courts should be agreed in principle by all". Non-Muslims, who overwhelmingly supported the opposition in the 2013 general election, are expected to withhold their votes from PAS now that the latter is no longer restrained by more secular allies. In the meantime, PAS' religion-centred supporters are unlikely to support a PH pact that generally rejects hudud. The net result is a lack of a credible front to stand against the BN and its core Malay nationalist vote bank, as multi-cornered fights in the next ballot benefit only the incumbent government. While PAS has clawed back the Malay support it ceded in 2013, the loss of non-Malay backing and potential multi-cornered fights in its traditional strongholds would also hand the advantage to Umno. A stronger Umno keeps the BN in power. But if BN's component parties are incapable of keeping Umno's Islamic agenda in check, they, too, could suffer and end up being token members of the government.